Created by J. Cortès Cigars of Belgium, Miramar Cigars also known as cigarillos offer a special blend of select tobaccos from multiple countries Honduras, Sumatra, Java, Brazil, the Dominican Republic and Nicaragua. 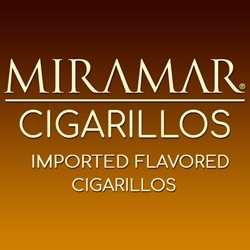 Miramar cigarillos are also classified as “little cigars” for their size 3 1/4″ x 20. These cigars provide a mild smoking experience with creamy perfect short, but satisfying smoke for the novice to the long-time smoker. Miramar Cigars come in four unique flavors Vanilla, Chocolate, Natural and Espresso, and packaged in boxes of 10 tins of 10 cigars each for a total 100. Miramar Cigarillos are now exclusively distributed in the US by Arango Cigar Co.
Smokers Discounts has made it easy and affordable to buy Miramar Cigars online. Every product can be delivered right to your doorstep. A variety of sizes and flavors are listed below in our online cigar store. Each of these styles are in stock and available for a low discount price! Call us for more details!